All-flash storage arrays are all the rage among IT teams looking to coax as much performance as possible out of their storage infrastructure. Thanks to the generational maturity of the technology combined with data reduction techniques like inline deduplication and compression, all-flash storage is no longer the economic impossibility it once was. Inline deduplication and compression mean these techniques are applied automatically as data enters a storage array. Flash controllers do not have to be instructed on which data to deduplicate or compress. This is not always the case. Many of the solutions on the market today support inline deduplication when possible but can’t guarantee that this critical function will not be interrupted by other storage processes like garbage collection. So why does this matter? As the array is populated with data and comes under demand, it is common with the lower end solutions on the market to fall victim to unpredictable performance due to gaps in their design. And, after all, isn’t the most important value proposition of Flash its predictable performance? The opposite of inline deduplication and compression, post-process deduplication, is less efficient and is not “Flash friendly” as it can introduce additional writes to the storage system. It requires storing multiple copies of the same data for, at least, a short period of time. And, post-process workloads can take IO cycles away from applications that may need them. Customers of vendors that release post-write cliff performance numbers know what they’ll be getting. If the vendor says a certain all-flash product can reach 150,000 IOPS, that array should be able to reach 150,000 IOPS at all times, even when it is nearly fully populated. But how big of a penalty can a write cliff really introduce? When an array can support > 150,000 IOPS, who really cares if there is a small impact, right? Unfortunately, write cliffs can have a devastating impact to performance and can render an array which is capable of hundreds of thousands of IOPS in to an array which is only capable of a few thousand IOPS which translates in to a direct impact on your business. 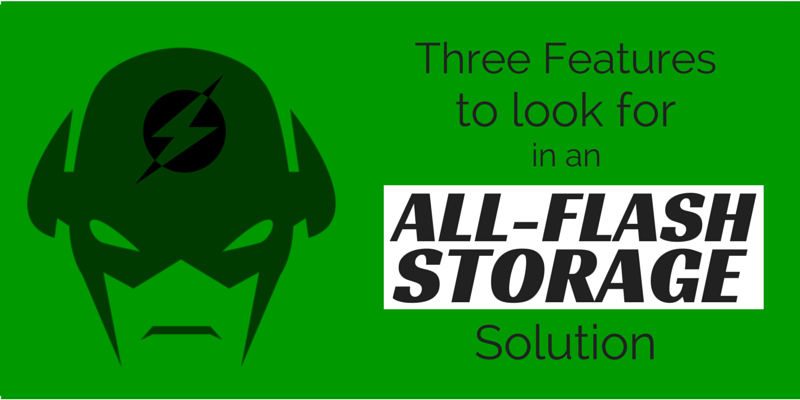 If you’re in the market for an all-flash storage array to accelerate your company’s critical workloads or even for general purpose storage, the best place to start is with a partner that has the expertise, experience, and vendor relationships to help you choose and install a solution that best meets your requirements. Such a partner will have the tools to analyze your data and predict your deduplication rate, giving you an idea of the effective capacity to expect from your all-flash solution. A good partner will also be familiar with your workloads and be able to make recommendations about how to fine-tune them to take full advantage of the power of flash. The ideal partner will also be able to educate your team on the various solutions in the market and be able to clearly articulate where these solutions thrive, and more importantly, where they will fall down. Is all-flash the right solution for your business’s workload and IT environment? Not sure? Check out our free whitepaper.